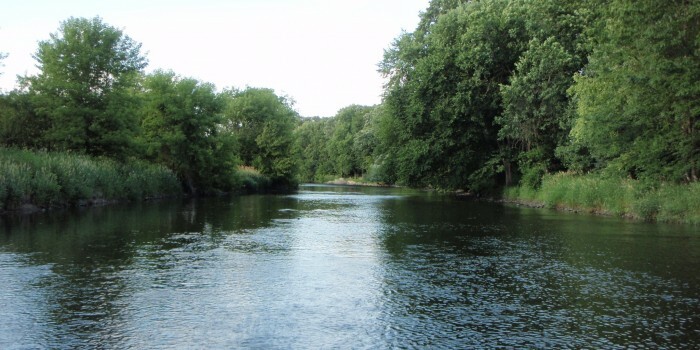 The DRSCW formed in 2005 in response to concerns about TMDLs (Total Maximum Daily Loads) being set for the East & West Branches of the DuPage River and Salt Creek. The Salt Creek watershed encompasses 152 square miles of highly urbanized land in western Cook and eastern DuPage Counties. It has a number of tributaries of which the largest are Addison Creek and Spring Brook. The main stem of Salt Creek is approximately 42 linear miles and has a rise of 225 feet. Salt Creek flows into the Des Plaines River in Lyons, which is tributary to the Illinois River. There are 40 municipalities located within the watershed and 11 publicly owned treatment plants discharge effluent to Salt Creek. Additionally, 6 combined sewer overflow outfalls are present. Land uses in the Salt Creek watershed are shown in the land use summary table. Measured at the USGS station at Western Springs (station 05531500), annual mean flow for the river is 135 cfs (calculated from data for water years 1946-2004). The East Branch DuPage River watershed encompasses 81 square miles of central DuPage and northern Will Counties. The major tributaries are St. Joseph and Prentiss Creeks. The main stem of the East Branch is approximately 26 linear miles. The East Branch joins the West Branch of the DuPage River on the Bolingbrook municipal line to form the main stem of the DuPage River. The DuPage is a tributary to the Des Plains River. Sixteen municipalities are located within the watershed. A total of 11 publicly owned treatment plants discharge to the East Branch as does one combined sewer overflow. 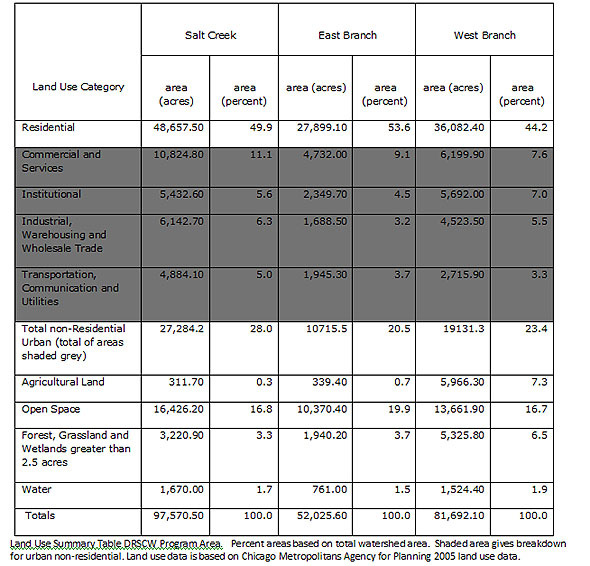 The land uses found in the East Branch watershed are mostly residential and urban and are given in the land use summary table. Measured at the USGS station at Bolingbrook (station 05540250) , annual mean flow for the river is 109 cfs (calculated from data for water years 1989-2004). The West Branch DuPage River watershed encompasses 128 square miles of DuPage, Cook and Northern Will Counties. 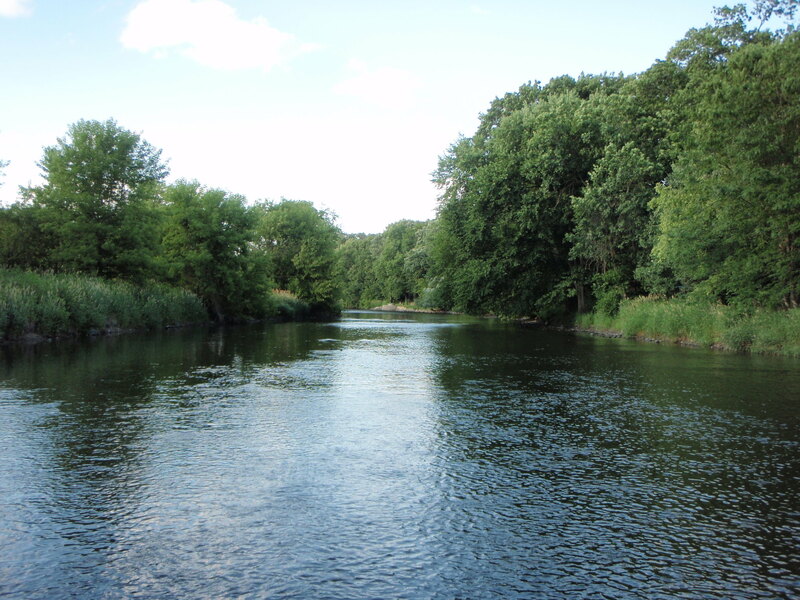 The main stem of the West Branch measures 34 linear miles in length. There are 21 municipalities in the watershed and 7 publicly owned treatment plants discharge to the West Branch. There are no combined sewer overflows in the watershed. Residential and urban uses dominate and are summarized in the land use summary table. Annual Mean flow for the river at Naperville (USGS station 05540130) is 154 cfs (calculated from data for water years 1989 -2004.